As sad as it is, one of my favourite parts of having a shower is using a lovely body moisturiser once I've dried off! 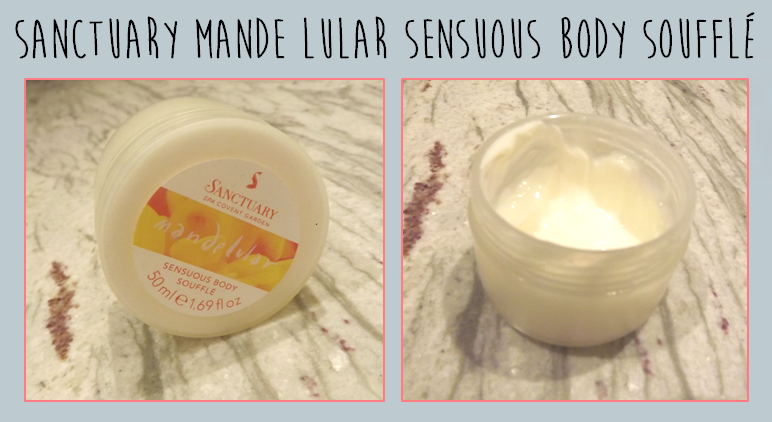 The moisturiser I am loving at the moment is this Sanctuary Mande Lular body soufflé. I'm getting through it with quite some speed, so thought I'd review it for you before it all disappears! "...combines a fragrant blend of exotic spices with a luxurious whipped-crème moisturiser. Containing only the richest ingredients, from nourishing shea butter to soothing chamomile and protective Vitamin E, this much-loved body souffle leaves skin moisturised, soft and gorgeously fragranced." It definitely is very fragrant and isn't too overpowering when it's on your skin. The smell does remain on your skin for a good number of hours though - if you used this in the morning, you'd still be able to smell it on your skin by early evening. I love this aspect of the moisturiser because it makes you feel fresh all day! In terms of consistency, it's really light and creamy. It's very much like a face moisturiser as opposed to a body butter. The benefit of this is that it soaks in to your skin really easily. It can be a pain when you have to wait around before you can put any clothes on for fear of getting product all over them, but this really isn't an issue with this soufflé! In under a minute it's been absorbed enough for you get on with your day. Finally, its' performance as a moisturiser is really effective. For the rest of that day your skin will feel really soft and supple - combine that with the lovely scent and you've definitely got a winner! I've actually just got the travel size (50ml) which you can get on the website - but they also sell a full size version. The Mande Lular range also includes other bath and shower products so if you are interested, definitely check it out!